This pic pretty much sums up what an older Artemis looks like in my head. He'd be in his late teens here. That could work! And would probably happen. Except for the bodyslam. Butler would never body slam. If he thinks that a spinning kick is awful I think he would commit suicicde at that one! So yeah lets just say that he'd have the photographer passed out on the floor with bruises all over his body within seconds! I am, once again, in love with this picture! Great picture. I think you've got the look pretty good there. Whoa! For a second there I thought that Artemis was going to jump out at me! Really excellent drawing! omg, he looks real!! like, really, real! you did this so outstandingly amazing! bravo!! It looks exactly like I imagine Artemis! perfect job! this is how i think of this picture... ahhhhh! dont eat me!!! 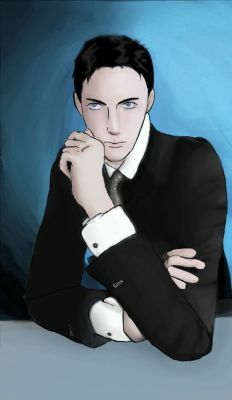 Does anybody else think this looks anything like Malfoy with black hair? yes he deos kinda look like malfoy but haw the hell does he look like daniel radfish oops! daniel ratface sos i give up. hay has anyone realised that all the people in my 'fanname are dweebs? HARRY POTTER IS NOT A DWEEB MALFOY AND SEVERUS SNAPE R DWEEBS AND HARRY MAKES OUT WITH GINNY AND RON MAKES OUT WITH HERMIONE IN THE DEATHLY HALLOWS!!!!!!!!!!!!!!!!!! AND WHO THE HECK IS MOLLY MOON??????? PS ITS DANIEL RADCLIFFE, RUPERT GRINT, EMMA WATSON, AND TOM FELTON!!!!!!!! SHEESH!!!!!! !